We love our mascot, Mia the Ladybug, because she’s caring and fun! Mia guides and supports each child through their daily learning activities and experiences. You’ll see her and her friends pop up during lessons and around the daycare. Hey I’m Mia and you should know, I’m the ladybug running the show. Hey it’s Zac, he tries new things and explores the world with his butterfly wings. Hey it’s Bob, the only frog who can solve any problem sitting there on a log. Hey it’s Sam, with dreams to spare, he’s a grasshopper with smiles to share. Hey it’s Ana, the helpful ant, she works hard and never says can’t. 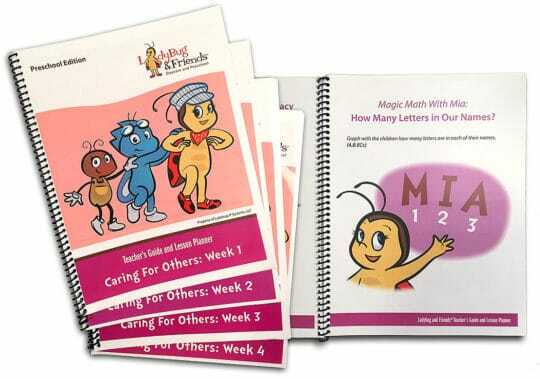 Our curriculum features Mia and her Friends, who make learning fun!